Project Perseverance is underway! For the next 2 weeks (right up until Saturday October 29th) the Cumberland Forest community is going flat out to meet some ambitious fundraising targets – and every penny is matched by a generous secret agent! There are so many ways to support the incredible effort underway. 2. Bid on the Perseverance Online Auction – the online auction goes live this weekend (October 15th) and there is SO much to buy from generous businesses and professionals who have donated to the cause! Bid up, bid often. Every $ raised will be matched. Check facebook and web Oct 15th for web links to the auction site. 4. 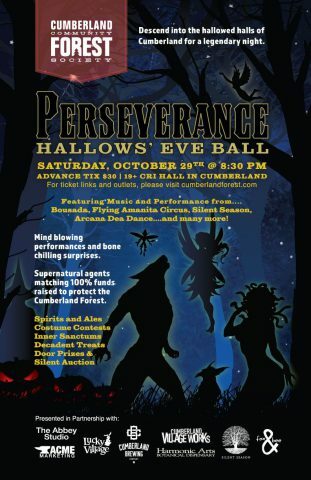 Get you ticket to the Perseverance Hallows’ Eve Ball – do NOT miss this spectacular Halloween event on Saturday October 29th. 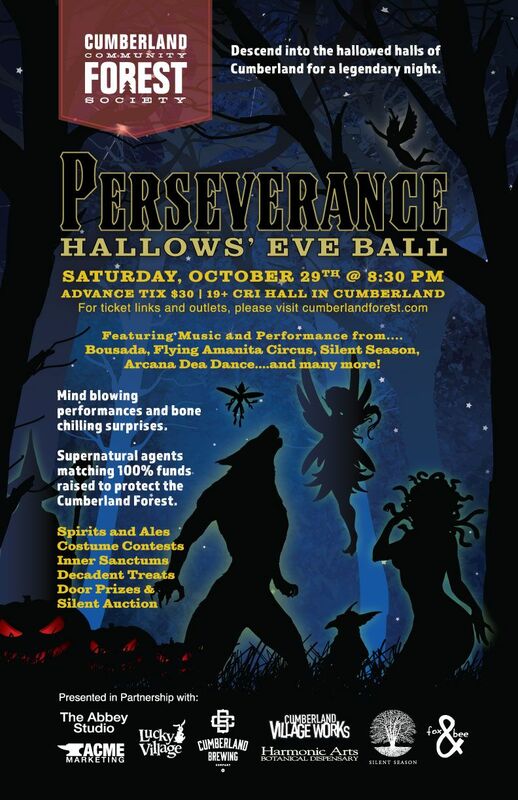 Music, dance performances, aerial acrobatics, inner sanctums, spirits and ales, costume contests and so much more. CLICK HERE TO BUY A TICKET or stop by Riders Pizza. Every $30 ticket purchased is matched by supernatural forces! 5. Donate Cash or Silent Auction Items – there are still lots of ways to contribute to this campaign! You can make a cash donation by cheque (just mention Project Perseverance in the note) and drop off at the Wandering Moose OR visit our special fundraising site HERE and donate to Project Perseverance by Credit Card. Donations for the silent auctions on Oct 23 and Oct 29 are also welcome. Late items for the Online Auction are also welcome as we can add items as we go – message info@cumberlandforest.com to make arrangements. 6. Spread the Word! – Share the web and social media links widely and tell your friends and networks about this incredible project and fundraising potential of Project perseverance. The Cumberland Community Forest Society is a registered charity and tax receipts are issues for all cash donations over $20.